I have a sense of humour, and I enjoy laughing at those strange and quirky things that comprise my life. My family is probably my greatest source of joy and laughter. However, my fellow brothers and sisters in Christ have provided me with many opportunities to snicker, giggle and guffaw. Today’s example, pictured below, is one such opportunity. I just had to pull over and take a picture when I spotted this one. I like a pithy sign as much as the next guy. My guess is someone probably though this was a good and catchy slogan. I am not too sure I agree with them on this one. Sometimes I wonder if churches really think about what message they are actually sending. 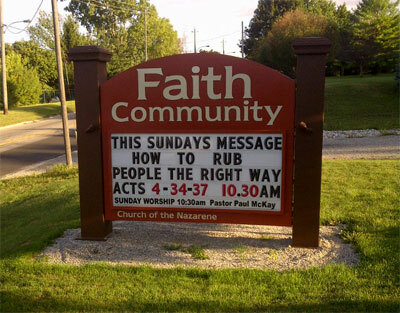 Do you want to go to a church that teaches you how to rub people the “Right Way“? What are your thoughts? P.s. I forgot to mention the other side of the sign says “When I said ‘love your neighbour’ I meant it. God”. When you read both sides together it REALLY makes you think.